The dynamic debut comprised of songs that focus on credit union history and philosophy from The Disclosures. 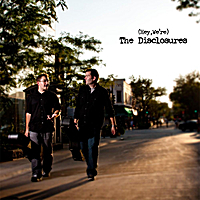 Dubbing a new genre of music called “thrift rock”, two Madison-based musicians called The Disclosures have released "(Hey We're) The Disclosures" featuring songs and lyrics that deal with credit union history, financial education and cooperative structure. It's the band’s first attempt at combining their musical abilities with their passion for democratically-controlled, not-for-profit credit unions. The all-acoustic album is comprised of seven songs written and recorded by Morris and Chad Helminak, who both work in the credit union movement, but completed their songwriting project outside of normal business hours. In addition to the album, The Disclosures have scheduled a number of upcoming performances at credit union events, including an education break-out sessions on credit union history and philosophy – infused, of course, with their original songs.